Automatically have your Gmail attachments saved to Dropbox. Tweet Feedly articles you’ve tagged. Text new appointments to Google calendar. Making these kinds of automated connections is the power of today’s internet. And you know what? It’s ridiculously easy to do. 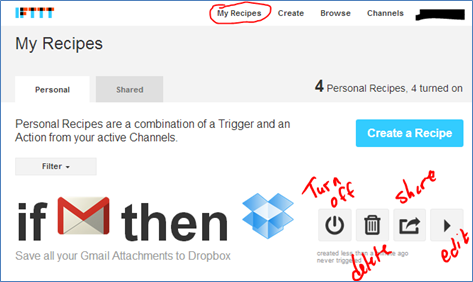 IFTTT stands for “If This Then That.” You can connect any one of 65 “channels” to any other one of their “channels.” A channel is web service, such as Dropbox, Gmail, Google Calendar, LinkedIn, Facebook, SkyDrive, Instapaper, Feedly, and Pocket. It includes being able to use text messaging or even phone calls. For the channels you want to use, “recipes” are the connections you make between those services. There are plenty of recipes that you can browse through, or you can create your own. 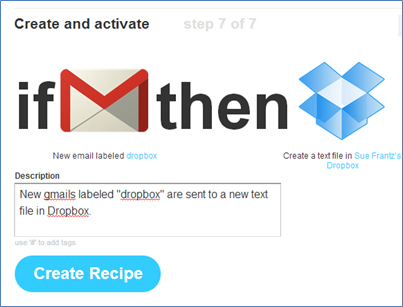 One recipe I found will let you automatically save all of your Gmail attachments to Dropbox. Services that operate via the web can choose to have an API (Application Programming Interface). Any service that has this code can be connected to any other service that uses that code. If you have services connected to Facebook or your Google account, those services are using an API. 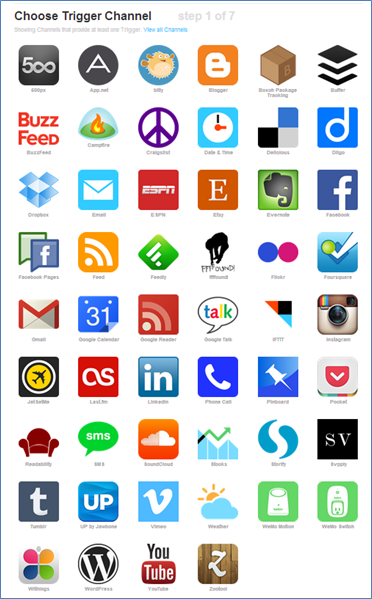 With IFTTT, you give them permission to access certain aspects of whichever services you’d like. After setting up an account at IFTTT, click on “Browse” then in the search box, enter Gmail as a search term. The recipe we’re interested in is fourth on the list. Clicking on “Save all your Gmail Attachments to Dropbox” generates this page. 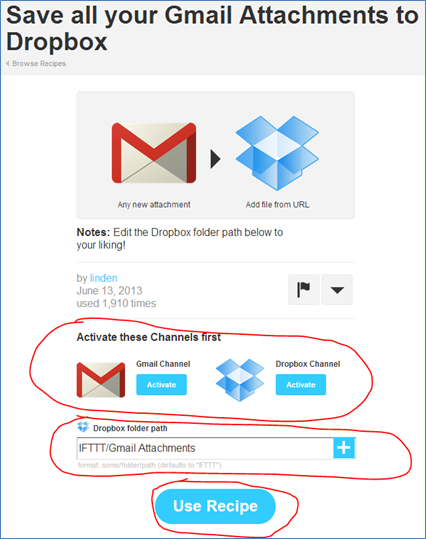 Since I haven’t given IFTTT permission to use my Gmail and Dropbox accounts, I need to do that first. When I click the “Activate” button under “Gmail Channel,” I’m directed to Google where I’m asked if I want to grant access to IFTTT. Since I do, I click the “Grant Access” button. And then I repeat the process for Dropbox. Now I need to decide where in Dropbox I want to save the attachments coming in from Gmail. 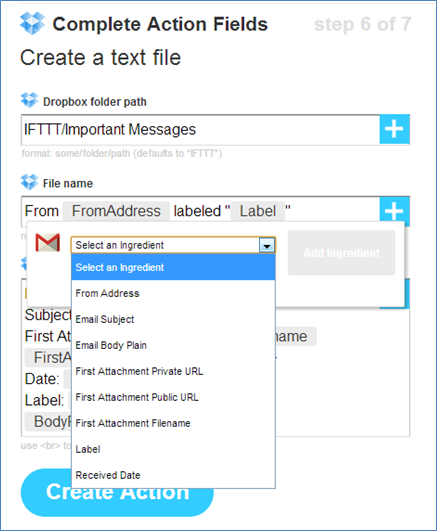 With the default, IFTTT will create a folder called IFTTT, and within that it will create another folder called Gmail Attachments. I’m good with that, so I just click the big blue “Use Recipe” button. At the very top of the page click “My Recipes.” You’ll see that it’s been added. 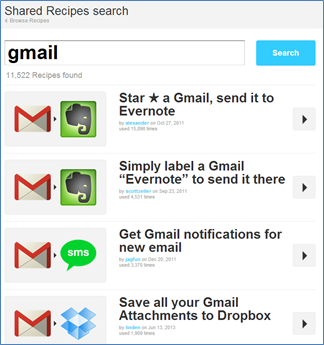 Use the icons to the right of the recipe the turn it off, delete it altogether, share it, or edit it. Click “Create” in the top menu bar. 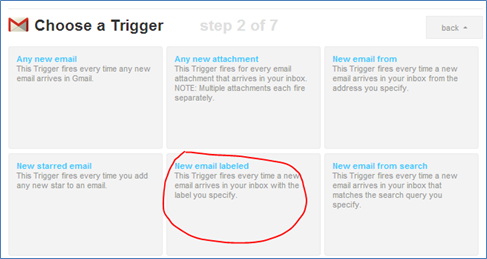 On the new screen, click the “this” link to tell IFTTT what you want the trigger to be. 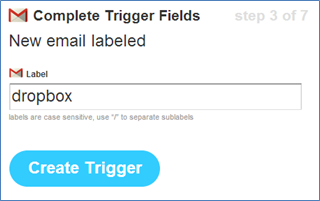 For step 1, you are asked what you want the trigger channel to be. Click on Gmail. In step 4, you’re given that same list of channels. This time, choose Dropbox. In step 6, IFTTT said that it would create a folder called IFTTT (if one doesn’t already exist by that name), and then it would put my Gmail messages in a subfolder called “Gmail.” I’m okay with the IFTTT folder, but I want the subfolder called “Important Messages,” so I typed that it. Next, we need to decide what we want the filename called. IFTTT defaults to what you see here, but we can change this to whatever we’d like using the “ingredients” list given. I decided that I want the filename to be the sender’s email address – subject line from the message – date the email was received. 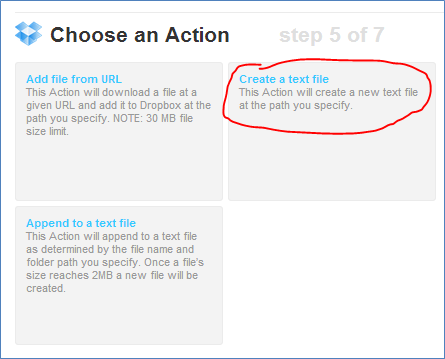 When it looks good, click the big blue “Create Action” button. Last step, add a short description. In Gmail, choose a message; right above the message is an icon menu. Click on the label icon, and type in dropbox. Gmail will ask if you want to create that as a new label. Assure it that that is indeed what you want to do. Now do a celebratory dance! Browse the recipes others have created. Take a look at the list of channels to see what services you’re currently using and how you might want to connect them. For the services you’re unfamiliar with, check them out. Previous Previous post: Feedly: Prepared to Disconnect from Google Reader?